Provided photo Unity National Bank employees, along with United Way of Miami County Director Sean Ford, recently participated in this year’s Unity Triple Crown Horse Races for a 2018 United Way fundraising event. In addition to being a 100 Percent Fair Share and Pacesetter company, Unity National Bank holds additional fundraisers for the United Way. Unity National Bank employees, along with United Way of Miami County Director Sean Ford, recently participated in this year’s Unity Triple Crown Horse Races for a 2018 United Way fundraising event. In addition to being a 100 Percent Fair Share and Pacesetter company, Unity National Bank holds additional fundraisers for the United Way. https://www.dailycall.com/wp-content/uploads/sites/30/2018/09/web1_Accociates-and-United-Way.jpgProvided photo Unity National Bank employees, along with United Way of Miami County Director Sean Ford, recently participated in this year’s Unity Triple Crown Horse Races for a 2018 United Way fundraising event. 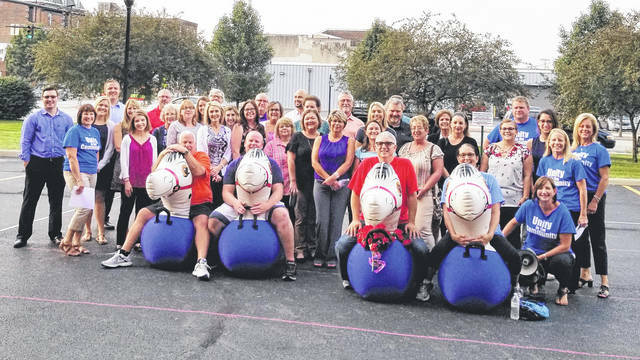 In addition to being a 100 Percent Fair Share and Pacesetter company, Unity National Bank holds additional fundraisers for the United Way.